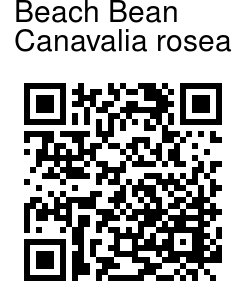 Beach bean is a herbaceous vine that trails along beaches and coastal areas. The thick, fleshy stem can grow to 20 ft or more in length and more than 1 in in diameter. The stem is rather woody near the base and several branches radiate outward, forming mats of light green semisucculent foliage. Beach bean has compound leaves with three thick, more or less rounded, fleshy leaflets, each about 2-3 in long. The leaflets fold up under the hot sun at midday. 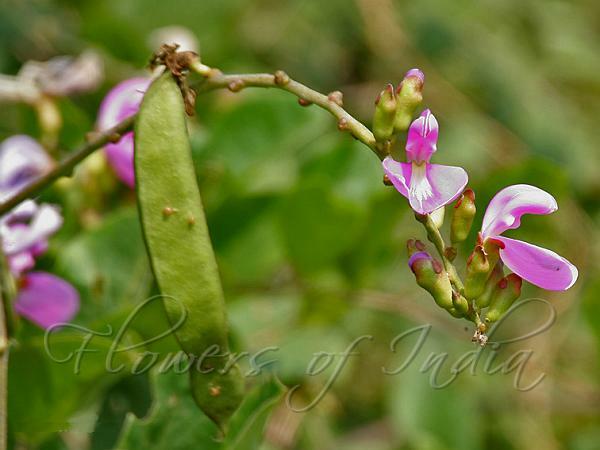 The flowers are typical pea flowers, purplish pink, about 2 in long and borne in erect spikes on long stalks. Beach bean blooms most of the summer and sporadically the rest of the year. The pods are flat and 4-6 in long. They are prominently ridged and woody when mature. Photographed in Kawal Wildlife Sanctuary, Andhra Pradesh.